Tis the camping season and it is every campers opportunity to do leave as little of an impact as possible. I have read lots of slogans and motto's this week including 'take nothing but pictures...leave nothing but footprints' and 'pack it in, pack it out'...well that just makes me sing 'pack it up, pack it in, let it begin....jump around....jump around' . 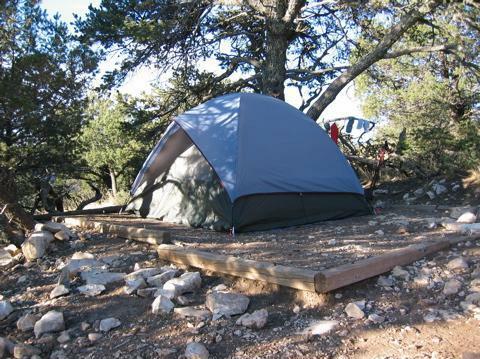 Here are 10 things you can do to ensure that your camping trip is low impact and responsible. 1. Recycle - Some campgrounds do offer recycling but if yours doesn't then take your recyclables home with you. Bring a special box or paper bag and just throw everything into it to take back home. For paper and cardboard use it to start your fire at night. 2. Follow the firewood policy - Firewood can contain pests which are not native to the area you are camping and could harm the habitat at the park. Watch for firewood policies at your campground and follow them! Also, don't chop down tree's in the forest around you for fire wood. Even pick up the fallen wood off of the ground can be bad. Those trees and branches provide rich nutrients for the growing forests. 3. Don't feed the animals - When wild animals are fed by humans they can become dependant on that food source and then when it is gone they can struggle to get back into their old habits of having to search and hunt for food. 4. Camp in designated areas - Camp sites are predetermined for a reason. Don't hack your way into the bush and create your own private area off of the camp site. Staying within the boundaries of the site will help to preserve the forests for future generations. 5. Pitching your tent - When tents are continuously put in the same spot on the site it will eventually wear the grass down until it no longer grows. Look for the worn out area's and put your tent elsewhere. This will help to give that area time to regenerate. If you are camping somewhere without predetermined campsites then ensure you do not put your tent up on fragile vegetation. Look for durable ground with as little vegetation as possible. 6. Use the fire pit - The fire pit is predetermined for a reason. Use it and do not create your own. If you hate where it is located in your site then think about looking for another site at the campground. By using the fire pit you protect the forests from fires and you also protect the campsite from looking like a gopher laden lawn. 7. Wash smart - Whether you are washing yourself, your clothes or your dishes ensure you use minimal water and biodegradable soaps. Wash dishes and clothes in a bucket or bin rather than under the tap. This will reduce your water consumption. Get a dish bag that is a mesh type material (non plastic if possible) and hang your dishes to dry! 8. Take it with you - Take your garbage with you. Either dispose of it in the proper bins at the campground or if none are available take it home with you. Plan ahead and think about what you are taking with you. I like to pre pack things in reusable containers so I do not have a bunch of packaging to dispose of. 9. Stay on the trail - When hiking ensure that you stay on the trails. If there are no trails then tread lightly and make sure that you aren't trailblazing a path in the woods. You want it to be like you were never there. 10. Smores - Yes smores. It is irresponsible to camp and not have smores. Really it should be illegal. I cannot wait to take Gwen camping for the first time. We're thinking of going this autumn, after the summer bugs and humidity have died down, but before it gets to cold. @Meegs - I bet she will love it! We went twice last year and B had so much fun. We had him on an air mattress the first time and that was such a mistake. He rolled all over the tent! Next time we had him in a pack n play and it was perfect.